Periodically, we’ll be interviewing researchers and showcasing projects that are using content from Vermont historical newspapers on Chronicling America. Our first interviewee is Frances Gubler, a graduate historic preservation student at the University of Vermont, who has been conducting research this fall on historic industrial and manufacturing buildings on Flynn Avenue in Burlington, Vermont, as part of a class research project. Fran graciously agreed to meet and share some of her newspaper findings. To start, I asked Fran what she found valuable about Chronicling America. “Chronicling America is easy to use. Microfilm is interesting, but it is also intimidating. With Chronicling America, you can do a quick keyword search and get results,” said Fran. In particular, Fran found Chronicling America invaluable for a certain Burlington factory, the Vermont Milk Chocolate Company. Before searching Chronicling America, she had found an insignificant amount of extant information on the company. She knew from the Burlington city directories that the factory was located at 208 Flynn Street in the early twentieth century, but did not know the Chocolate Company had actually constructed the factory building itself until finding an article on Chronicling America from January 10, 1918, describing the company’s first big order of a million dollars worth of chocolate from the Massachusetts Chocolate Company, days after the company’s factory was completed on Flynn Avenue. 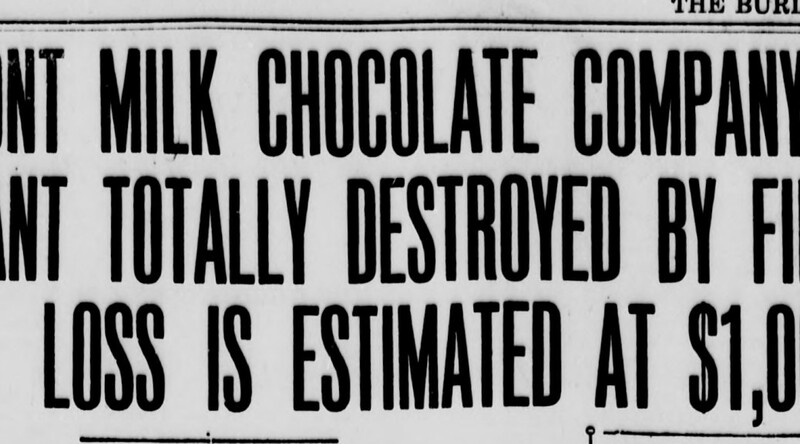 Details of incredible amounts of Belgium chocolate from the Burlington Weekly Free Press, January 10, 1918. The other article Fran shared with me told of a quite a different turn of events for the company. In bitter, perhaps ironic, contrast, only half a year later, the Vermont Milk Chocolate Company was in the headlines for a million dollars again, but this time it was for a great loss. News of the horrific fire and the immediate rebuilding plan were detailed in great depth in the Burlington Weekly Free Press on May 2, 1918. With these two articles, among others, Fran was able to piece together a more complete history of the Vermont Milk Chocolate Company. 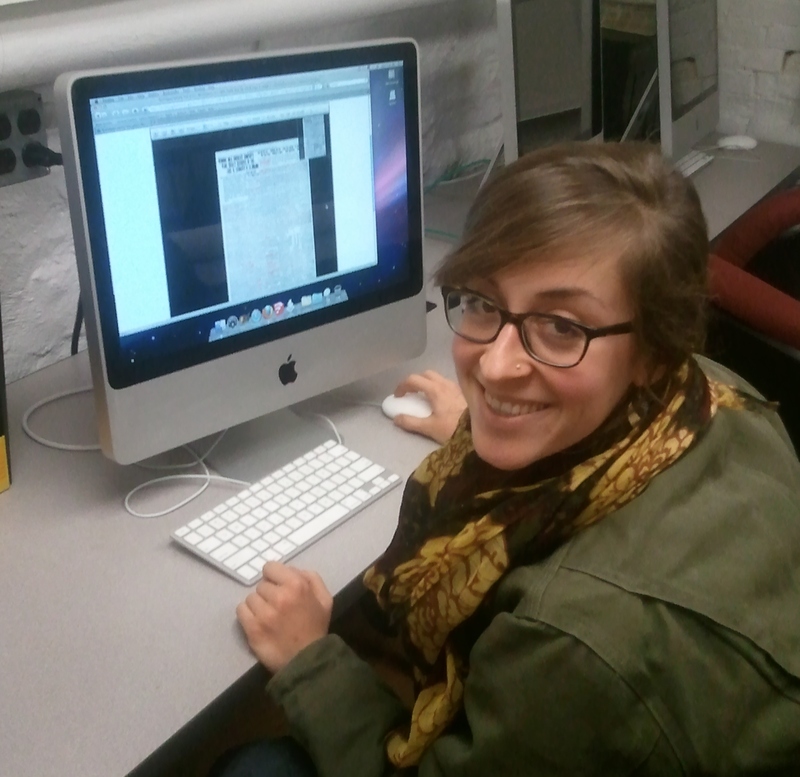 Fran, along with the rest of the historic preservation graduate students in HP206: Researching Historic Sites and Structures, will be publishing all research findings online at the end of the semester. We’ll be sure to post the link when it comes out! An immense thanks to Frances Gubler for taking the time to talk with me about the project, Chronicling America, and her local history research. UVM’s Historic Preservation Program has also conducted similar research projects in the past using Chronicling America. Last year’s HP206 class did research on historic Burlington postcard views. View their research findings here. If you have used Chronicling America for research, and would be interested in being featured in our user spotlight series, email Karyn at knorwood@uvm.edu. We love hearing about all the interesting and innovative ways that Chronicling America and Vermont historical newspaper content are being utilized. I worked summers as warehouseman in 208 Flynn Av. in the ’60s and ’70s. There were no signs of fire damage then but on hot days there was an aroma of chocolate especially in the basement. Somehow I (Karyn) just saw this comment! That’s really interesting, Samuel–especially concerning that lingering chocolate smell! Thanks so much for sharing.